We take family traditions pretty seriously in the Kay Clan. Holidays are no exception. At Christmas there were always cinnamon buns and grapefruits for breakfast. My sister and I would buy ridiculous matching festive pyjama pants and my parents would sport santa hats. A baileys coffee while opening gifts was a welcomed addition as we got older. April Fools Day was another good one. Our underwear drawers would be empty and the milk cartons filled with water and the spoons gone missing. Getting ready for school on April 1st was a nightmare, my mom, however, thought it was hilarious. My mom was also the queen of easter egg hunts. Trails of clues all throughout the house and then out to the garage and down the street and back would lead you to the final jackpot, most likely hidden in the washing machine. I have the greatest memories of my sister and I running around trying to figure out the clues to find the treats that the easter bunny had left us. As we grew up though, a simple ‘hunt’ wouldn’t do and parents created the Amazing Easter Egg Hunt Race. My dad was deemed judge and all of a sudden we really had to work for our clues. There were sprints in the backyard and puzzles and jumping jacks and card tricks and to be honest I think it was just an excuse for my parents to watch my sister and I do some pretty ridiculous things just for a couple of chocolate eggs. There were always so many giggles though. You can imagine now, how confused Matt might have been as he met my family for the first time on easter weekend. My parents went all out, there was a jelly belly flavor guessing challenge and we were doing stair runs bringing up fire wood from the basement (nice one dad) and golf balls were being hit into the back field. Do you think my family is crazy yet? Anyways, I don’t remember who won (me) but I do remember seeing Matt laughing and cursing and running around with the rest of us and I just knew he would be around for a while. All of this and if you ask him what his first impressions were of my family he’ll tell you that he thought we were totally crazy for serving crackers with cheese. Crackers. With cheese. Not bread. He’s French and we’re nuts. And then he’ll tell you that he tasted my mom’s carrot cake for the first time and he decided to stick around of a bit. A big bowl perfect to kick off this spring season. 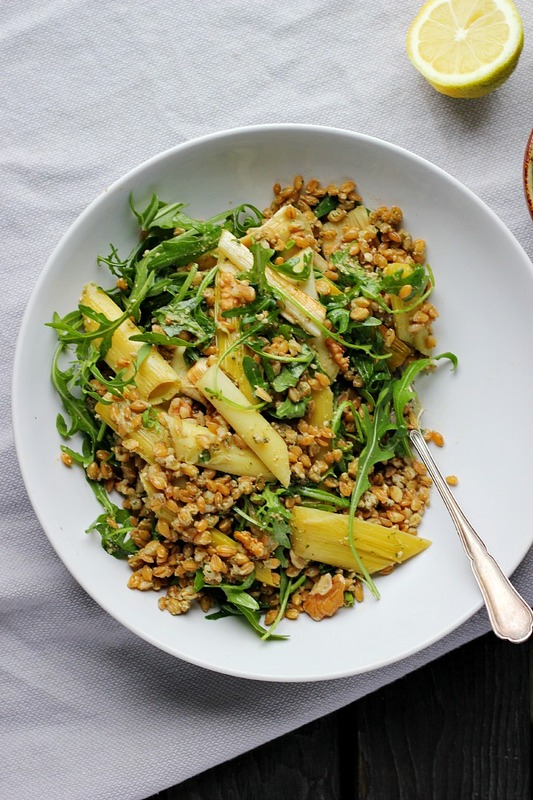 I love the nutty farro combined with the sweet, slow roasted leeks. Leeks don’t always get the center piece but in the spring months when they are thin and tender and such a beautiful green I think they are worth the spotlight. Leftovers make a great lunch the next day and the pesto can be kept covered in the fridge for a few days. Preheat oven to 175 C / 350 F and bring a kettle full of water to boil, meanwhile prep the leeks. Chop and discard the dark greens parts of the leeks and remove the root-y ends. 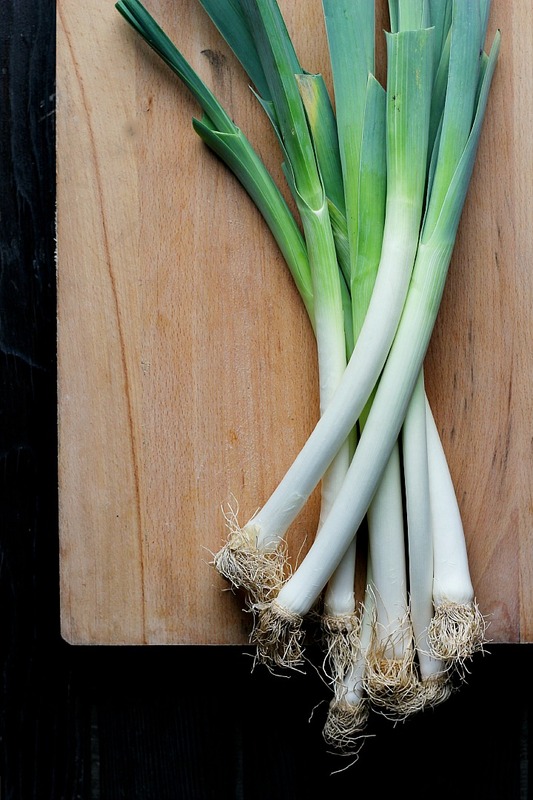 If your leeks look dirty remove the most outer layer and rinse under cold water. 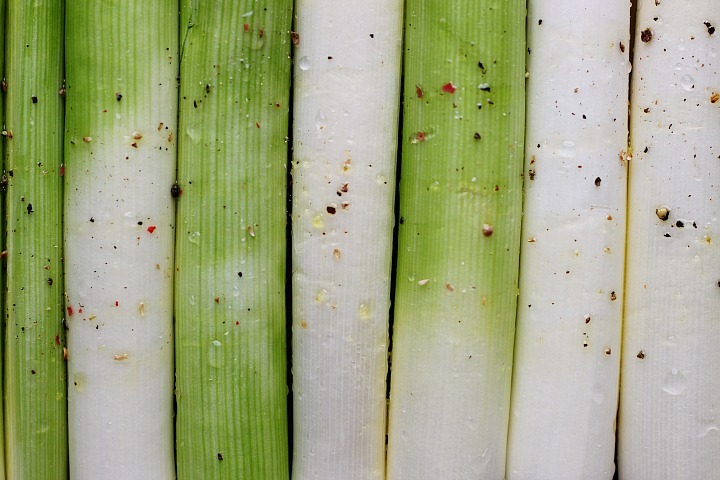 Cut leeks into whatever length you need so that they line up nicely in your baking dish. Place leeks in a large bowl and cover with boiling water. Let sit for a few minutes, then strain and place in baking dish. I find this step helps remove any hidden dirt and softens the leeks so that they don’t get stringy after roasting. Drizzle with a tablespoon or two of olive oil and season well with salt and fresh cracked pepper. Place in the oven to roast, turning once, for about 40 minutes or until soft, time will depend on the size of your leeks. If they start to get crispy around the edges turn down your oven temperature so that they can cook through entirely without burning. 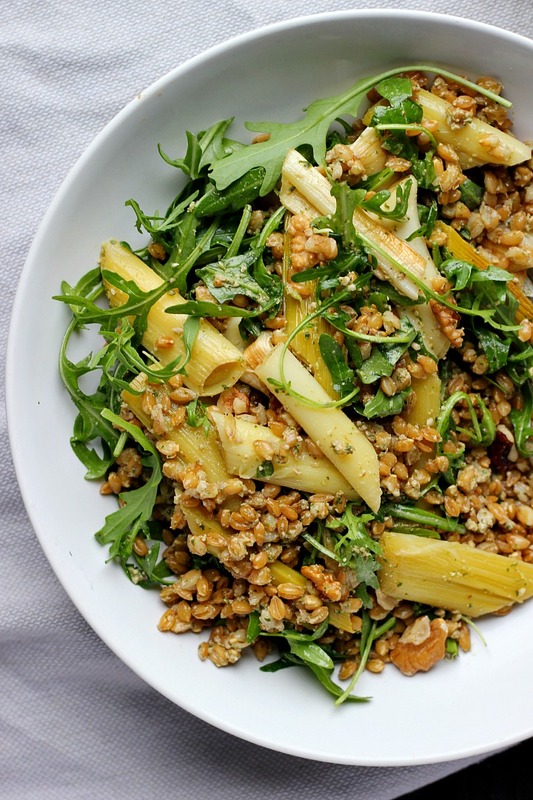 While the leeks are roasting, cook your farro. I like to soak mine in the morning, I find it helps in digestion and reduces cooking time a bit. Drain and rinse the farro, then place in a small sauce pan over medium heat. 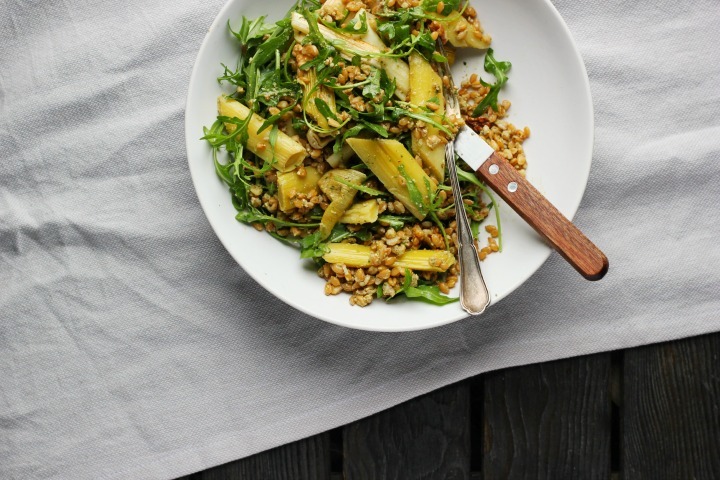 Toast the farro in the dry pan for a few minutes, until the farro is dry and fragrant. Add 3 cups of water and a pinch of salt and bring to boil, then reduce to a simmer for 35 minutes, or until the farro is cooked through but still al-dente. I like it with a bit of bite. Strain any excess water. 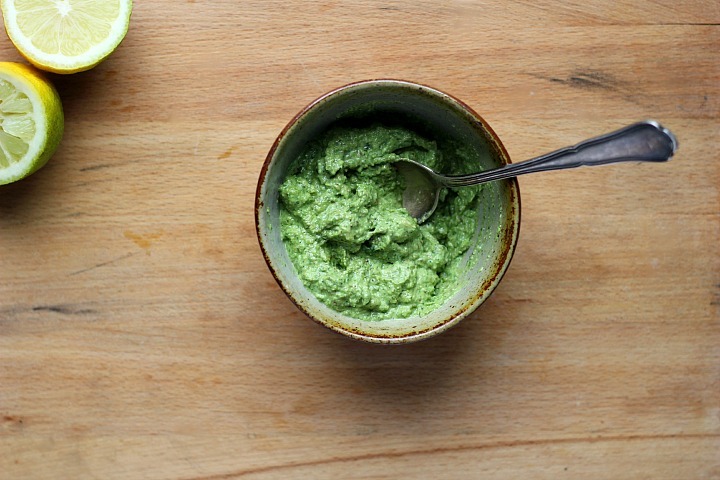 Make the pesto. Place walnuts, rocket, oils, mustard, garlic and lemon juice in a small blender and blend until smooth or just a bit chunky. 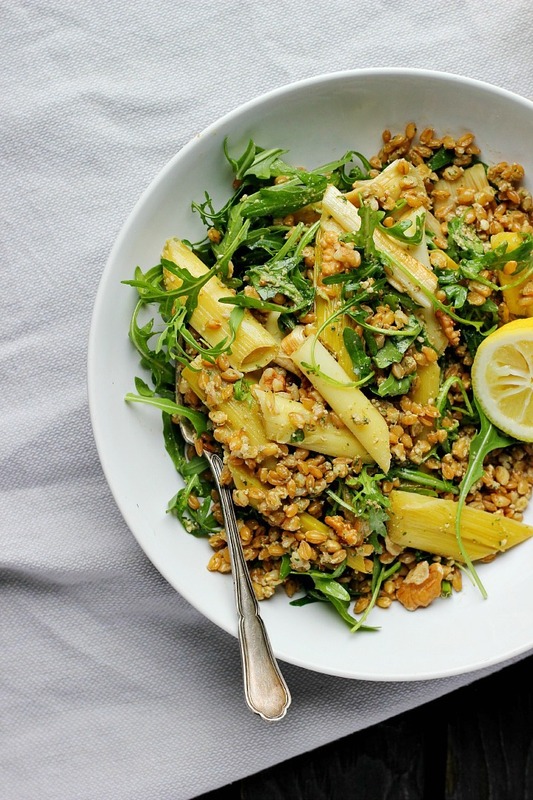 Cut leeks into chunks, toss with farro and half the pesto. 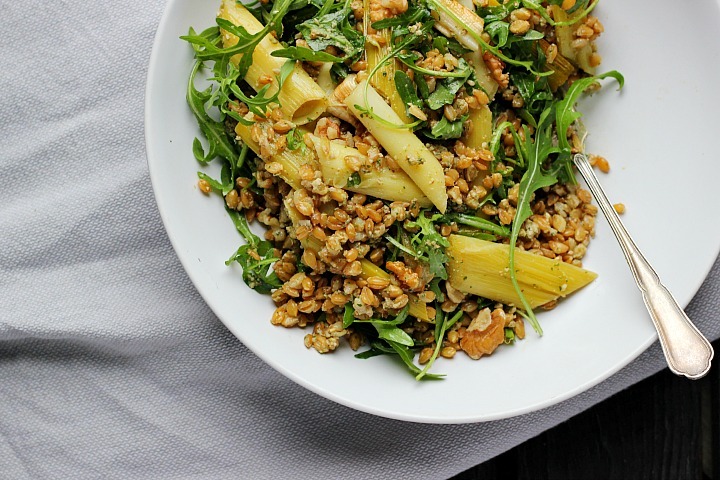 Drizzle with a little extra olive oil and serve with fresh rocket, a few extra walnuts, lemon zest and lots of pepper. Serve with extra pesto on the side. * The leeks. If I’m serving this as a main I count about 3-4 leeks per person if they are thin ones, 2-3 if they are bit thicker, I was opt on the side of leftovers too. 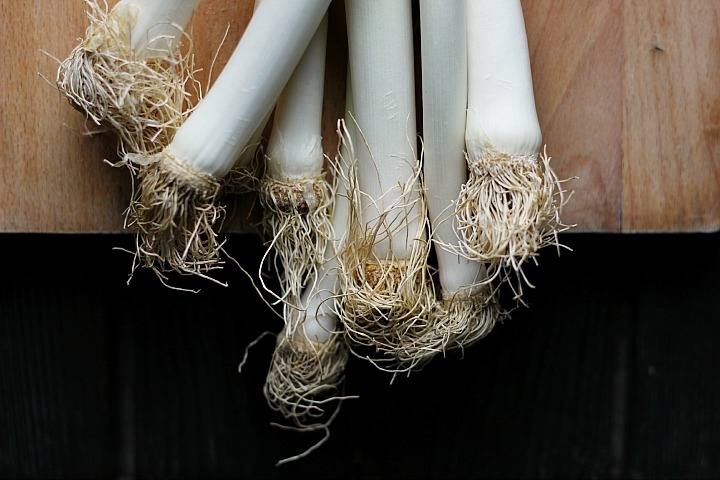 Look for leeks with long thin white parts. Cooking times will vary depending on the size of your leeks. * The grain. You can sub wheat, spelt or kamut berries here, I like the toasty nuttiness of these ancient wheat grains, but if you need a gluten free option millet or buckwheat groats will work too. Cooking times will vary so follow package directions. I love your voice, you crack me up! This looks amaaaazzeee. Sexiest leeks I ever did see! 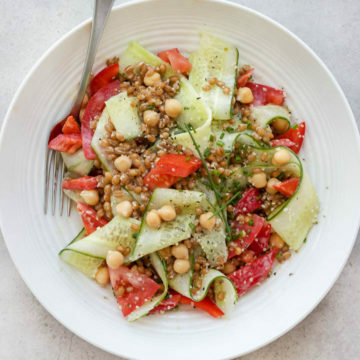 I love hearing about the traditions on other people’s families – it kind of makes my own seem a little bit more normal ;) And this bowl of deliciousness looks just what I’m craving right now – tasty and full of flavour. I think this is my favorite post of yours I have read yet! Those traditions! Oh they made me laugh so great. Those are just the best. Totally journalling about those so I can remember to do them to our kids as well. Ha! And this dish looks incredible! I totally just shot a veggie/pasta/pesto dish this last week, you and I’s flavor cravings are back on track again and I love it. And rocket?! 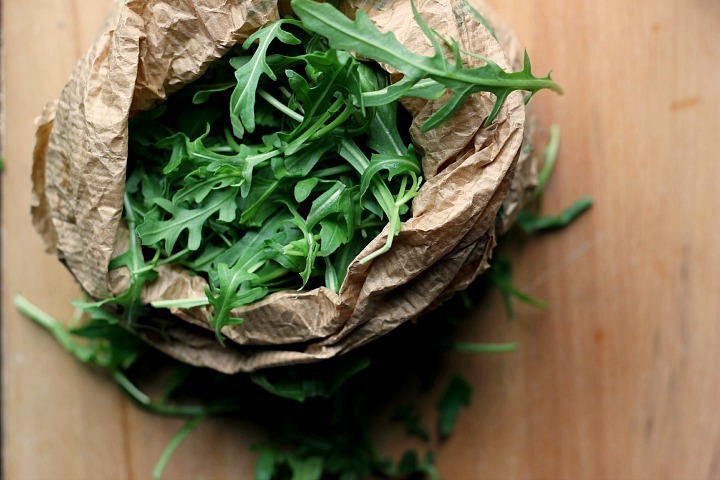 I had no idea arugula was called that and it is now my new favorite green. I want to buy rockets.